The Canton reservoir has treated me and my friends very well for over 10 years. It is my favorite spot in the south shore but has become more challenging over the last few years. With increased water pressure and heavy vegetation, the proven honey holes are producing less quality fish. That being said, it is still a great place to fish, offering various types of structure and an opportunity to fish pretty much every type of lure with success. As far as accessing the pond, there is a park off of Pleasant St where you can park and drag a car topper or kayak down to the water. Please note, this is a public park and is locked from sunset until 6AM. I think if you want to get a real boat in there, you will need to know someone with property on the shore. 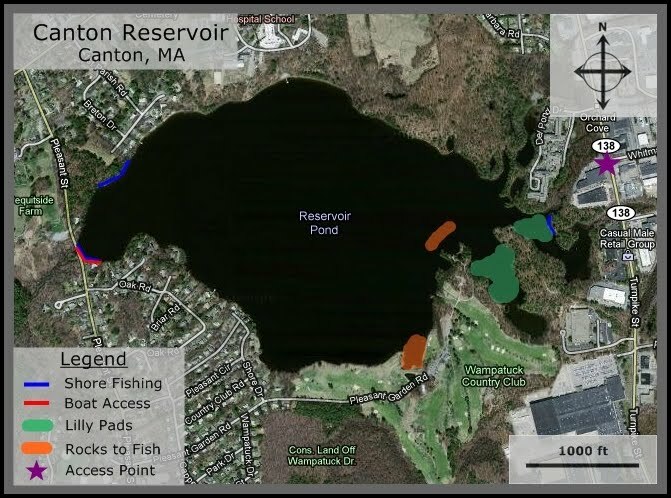 If you want to immediately catch fish at the Res, you should head straight for south east corner which is directly up against the Wampatuck Country Club. There is a par 3 hole on the shore, where a cove cuts into the land. This spot is absolutely stacked with bass. You can fish the edges or the middle because there are boulders submerged everywhere which give the bass lots of structure. We've pulled a few 3 and 4 pound bass out of that cove, so that's always our go to spot. Along the eastern shore there are two coves inlets that you can fish if your boat can get into really shallow water, like 2-3 feet. Between the two inlets tho is a little rock that normally holds bass so feel free to drop an anchor and run some crankbaits or jigs through there. Depending on the water level, you can see some branches poking out of the water. I believe this used to be marked with a bouey but I think that's been removed. If you head to the northern shore, we've had some recent success throwing some large swimbaits and poppers up and down the weedline, pulling in multple 4+ pounders. If you're looking to fish from the shore, there is one spot that will give you some good access. If you park behind the ENE building on Route 138, you will find a path that leads out to the water. This was the only spot we used to fish from about 8 years ago and we caught plenty of bass. It gets fished a lot and can get very shallow in late summer, so I'm not 100% how much it will produce. We have had a little luck fishing in the middle of the reservoir but its pretty big and there aren't many drop offs to fish out there so it's usually just a crap shoot. I've fished here at least 1/2 dozen times and recently (July 30, 2011) my fishing buddy caught 13 Largemouth. Most were 2-3 lbs, a couple were close to 4 lbs, and one lunker 6-7 lbs late in the day, near the shore line close to the many housing boat inlets on the south-western shoreline. He was banging them nearly every cast close to the country club shoreline and I got 3-4 nice pickerels but no bass. We were in a 12 ft canoe, started at daybreak and left at 5PM. All catch and release. I;d like to try other places but Canton Res has been so productive for us this year, we just can't leave. He is Master Gilly and I am happy for him even if I don't catch that day. Spinner baits and top water crank baits work well, rubber worms too. SLOW Retreive!! Patience pays off! Tight lines! If you drive a quarter mile past the restricted area on pleseant street, up on your right there is a dirt road with a sign and it leads you to a wide open parking area, then you can drive your truck/boat about 5 feet from the water and drop in, we actually stopped by the police station to ask them one day.